9N11450A, 1996487. 9N (to Serial Number 12499). Ford/New Holland. 70 amp Starter Switch. 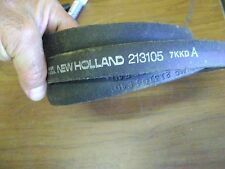 New Holland Mower Deck wheel 83970390 AUB121712 aftermarket 914A 54" 60" 72"
Replaces part number AUB121712 OR 83970390. TREAD: SLICK. Part listed replaces part numbers and fits machines listed, however there can be other part numbers depending on when the machine was built. Ariens New Holland S-12 Kohler Muffler. I'm sure this muffler will fit most tractors with a Kohler K301 engine. YOU ARE BUYING AN EXCELLENT QUALITY BELT. 86546604 FILTER New.Holland parts 450, 540A, 540, 545A, 545, 540B, 745-SERIES, 19-955, 445, 340B, 19-854, 19-855, 340, 19-856, 340A, 19-857, 19-858, 445A, 19-863 FILTER. This is a Genuine OEM Case IH/New Holland Light Bulb, 34909-880-000, used on many different applications. MTD Yard Machines 20hp/50" Tractor Hood USD 44.99. John Deere 316 w/Onan 330 318 Tractor Hydraulic Line - Power Steering Outlet USD 9.99. John Deere F910 F911 F912 F925 F935 F932 Front Mow Tractor Adjustable Seat Mount USD 29.99. WE DID GREASE IT. IT SPINS FINE BUT YOU CAN FEEL THAT IT IS A LITTLE ROUGH. THE BEARINGS WERE DRIED UP. THIS DECK IS IN REALLY NICE SHAPE. NO WELDS OR REPAIRS. I DO NOT THINK I HAVE ALL THE HARDWARE AND BRACKETS TO MOUNT IT TO YOUR TRACTOR BUT YOU GET EVERYTHING I HAVE IN THE PICTURES. THIS DECK IS POWERED OFF OF THE REAR PTO WITH A REAR PTO DRIVE BOX. Also fits Toro 99-1933. Made in USA. Based on the part #, this will fit the following models: LS35. John Deere 322 332 318 Tractor Power Steering Cylinder Steel Lines USD 24.99. John Deere 322 332 318 Tractor Power Steering Cylinder Rubber Lines USD 24.99. Replaces: 160191. Oregon Lawn Mower Blade for Ford/New Holland 72" Cut. It is essential that the Mower Manufacturer’s Installation Guidelines are followed exactly when installing blades. It is essential that you ensure that these blades are the correct blades for your mower. THIS IS NEW NEVER USED. JUST A LITTLE DIRTY FROM SITTING ON THE SHELF. Up for sale is this New Holland Gas Tank . It is in good working order with normal wear it has not holes or leaks in it. May fit other Models. That way you will know for sure if it will fit your model of mower.Cause that what we are here for.To get you the right part for you mower. Used New Holland LS45 Riding Mower Rear Fender, Removed in working order, Good shape,Minor Scratches/Scuffs/1 Dent (SHOWN IN PICTURE) Check out all My pictures. Changing Your Mind. Ordering By Mistake. Check out all My pictures. Parts Removed From Mower Shown In Last Photo (Complete Mower NOT Forsale). Changing Your Mind. Replaces Part Numbers: 8N9510C-HD, 8N9510C, TSX241B, TSX-241B, TSX241C, TSX-241C, TSX33. Heavy Duty. LX485 serial number 871090 and up. LX465 serial number 877549 and up. L465 serial number 864643 and up. Buy direct from the manufacturer and save. Used New Holland LS45 Riding Mower Hydro Transmission Assembly, Removed in working order, No Issues, Very Responsive. No Hubs Included. Check out all My pictures. Parts Removed From Mower Shown In Last Photo (Complete Mower NOT Forsale). 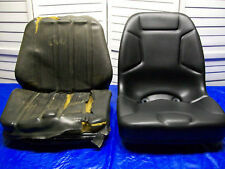 Used New Holland LS45 Riding Mower Rear Fender With Cup Holder, Removed in working order, Good shape. Parts Removed From Mower Shown In Last Photo (Complete Mower NOT Forsale). All OEM part numbers and logos are to be used for identification purposes only. John Deere F910 F911 F912 F925 F935 F932 Front Mow Tractor Adjustable Seat Mount USD 29.99. MTD Yard Machines 20hp/50" Tractor Hood USD 44.99. John Deere 322 332 318 Tractor Power Steering Cylinder Steel Lines USD 24.99. Part#: TR79D1900. This is a NEW OEM Ford or New Holland Spindle Shaft. MAY FIT OTHERS. PARTS ARE IN GOOD WORKING CONDITION. YOU WILL GET WHAT IS PICTURED. THESE ARE IN VERY NICE SHAPE. GOOD USED PARTS. Replaces Part Numbers: C5NNN879A, 86509731, 112192. Also fits:Ford Industrial Construction Models: 231, 233, 333, 335, 340, 420, 445, 450, 515, 531, 532, 535, 540, 545, 3550, 4140. PART # AUB161019, AUB161021, AUB161020, AUB407381. WE HAVE THE GEARBOX CHAIN, SPROCKET 32 TEETH, DRIVEN SPROCKET 16 TEETH, IDLER SPROCKET IN GOOD WORKING CONDITION. 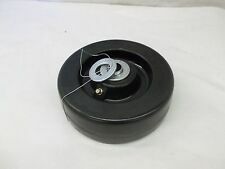 IDLER IS LIKE NEW AND SUSPECT IT WAS REPLACED SHORT BEFORE IT WAS PUT OUT OF USE. Used New Holland LS45 Riding Mower, Dash Panel, Good Shape, No Cracks, Minor Sun Fading. Check out all My pictures. Parts Removed From Mower Shown In Last Photo (Complete Mower NOT Forsale). Changing Your Mind. REMOVED FROM A FORD 1210 WITH 865 HOURS. -local pick up available. Up for sale. PRODUCT # UC09013.